101210 - Up and G and I heading out on the town. We went to Meijer so he could do his Christmas shopping and he did really good. Then on to Home Depot where got some project supplies. We then had a nice lunch at Wendy's. A quick stop at the bank and we made it back home. G decorated some paper lunch bags and we put the gifts he got for LD&J in them. 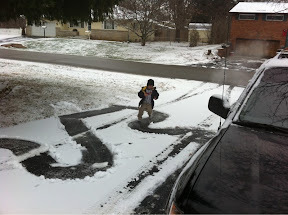 I headed out to consume the supplies we got while G got all dressed up in full camo. 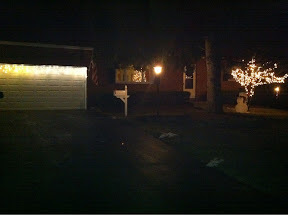 We put out our new inflatable snowman and the lights across the garage door. L came home and loved the new decorations. 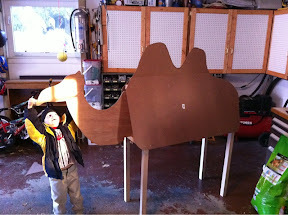 G and I then built a camel for the Christmas program at church. D&J home and we all headed to the premier of the new Narnia movie. We had subs and Chinese for dinner. A bit of Wii and LEGO time and then all boys to bed. I stayed up doing some paperwork and then took a picture of G&I's work on the lights when putting things in the mail box. A good day!